Pack up and move right in to this immaculate 3-bedroom residence at the Michael Graves-designed Impala, one of the Upper East Side's premier condominiums. This triple-exposure corner apartment showcases open city and/or East River views from every room. Facing north, west, and east, natural light streams into the apartment every hour of the day. From the recessed LED and accent lighting throughout to the custom door knobs and cabinet pulls, every detail has been carefully considered with the most discerning buyer in mind. 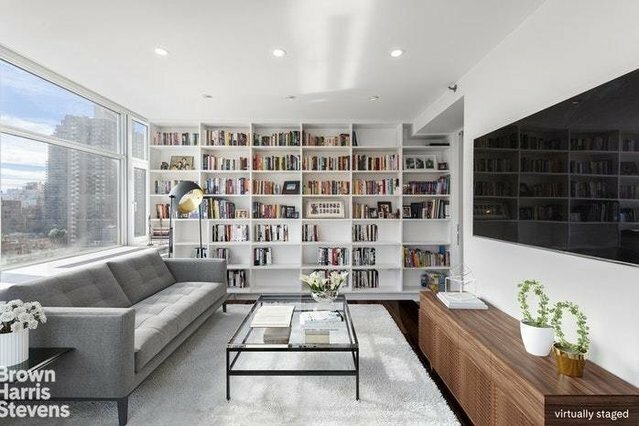 Recently undergoing a top-to-bottom renovation, the apartment stuns with a versatile, open floor plan and is outfitted with top quality finishes. Upon entry you are greeted by a generously-proportioned foyer. Rich, wide plank hardwood floors flow into an open-concept entertaining space. There, a brand new chefs kitchen awaits, boasting Caesarstone countertops, back splash and breakfast bar, world-class fixtures, and custom cabinetry artfully complementing a suite of appliances including a stainless Wolf range with hood, concealed Sub Zero refrigerator with custom paneling, and Miele dishwasher. Beyond the kitchen the residence opens into a lofty entertaining space. Abundant closets, a full guest bathroom, custom built-ins, and a concealed bar with wine fridge top off the laundry list of brand new features that make this the perfect home for both luxury living and entertaining. The north and west-facing corner master suite offers the utmost in privacy and luxury, while the en suite master bathroom features his and hers sinks, custom cabinetry, and five-star finishes. Off the main foyer is a separate wing featuring custom closets, two full bedrooms, a third full bathroom, and a Bosch washer/dryer. The Impala is a 31-Story Condominium designed by famed architect Michael Graves. Amenities include a full time doorman, on-site parking, a tranquil 15,000sqft landscaped courtyard with water features, fitness center with steam/sauna, spa and massage rooms, business center with conference room, children's play room, bike room, and storage room. Located minutes from the Q-train and accessible from the FDR drive, The Impalas location is prime for both convenient commuting and travel. The Impala is a Smoke-Free Building. Pets OK.